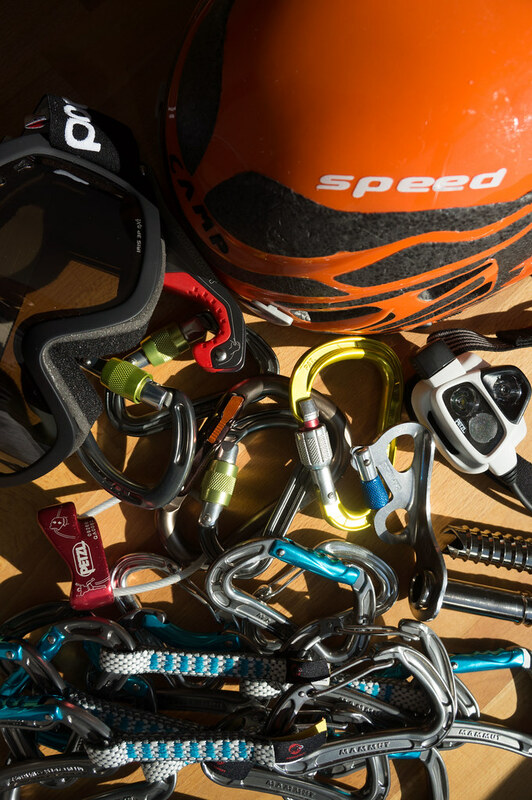 Besides boots, crampons, ice axes and a backpack there’s a few more pieces of gear an ice climber needs - ice screws, belay devices, slings, quick draws, and and and. In this article I highlight some of the assorted ice climbing gear which I have used during this years ice climbing exploits. The Gold Standard in ice screws, the Black Diamond Express have the best price/ quality ratio and perform superbly on the ice. 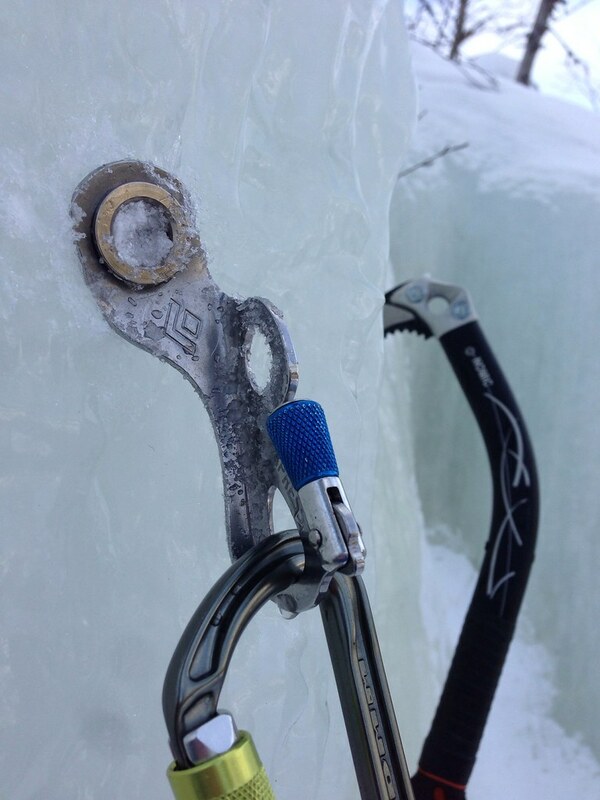 Easy to screw into the ice with one hand thanks to the crank and with to two carabiner holes to clip in, the Express ice screw helps you to secure yourself quickly when the going gets tough. Petzl will bring out a similar design next winter which performs very well, and Grivel’s 360 ice screws too is great. However, at the moment Black Diamond makes the lightest screws and they’re very well priced, thus these excellent ice screws shouldn’t be missing on any ice climbers rack. 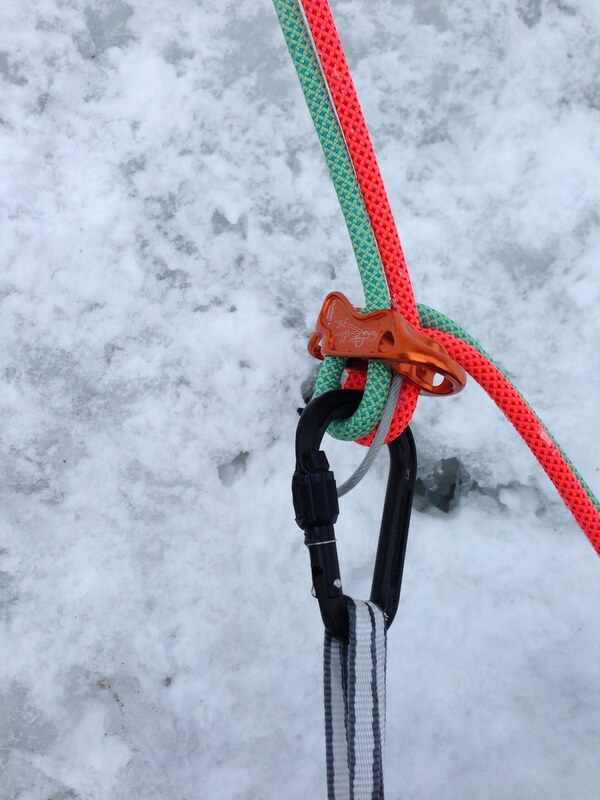 Slings are an important piece of gear when climbing ice whenever you don’t toprope. 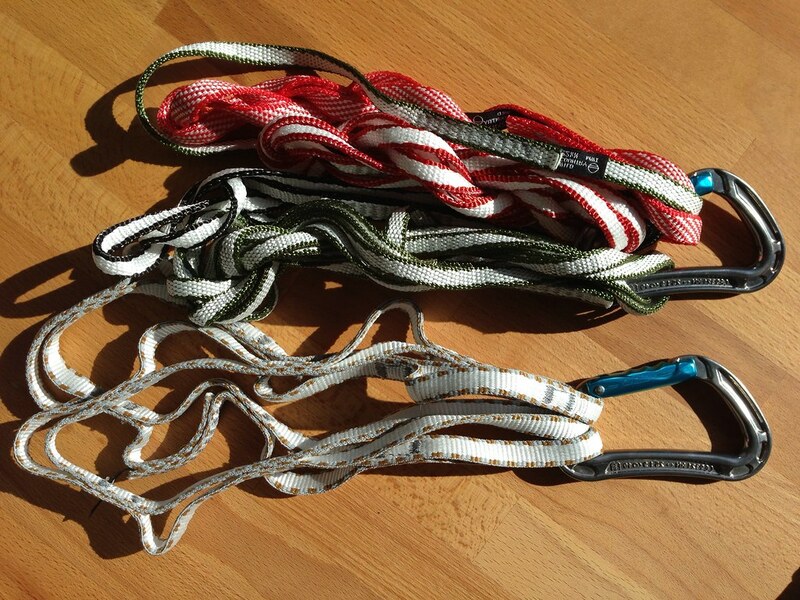 A 120 cm sling is essential to build a belay station together with two ice screws, and a daisychain or another 120 cm sling are needed to secure yourself at a belay station. They also can be very useful when setting screws and taking care that the rope isn’t making a wide curve (Imagine it a bit like this sign < where the three points are ice screws and the line is the rope. With a sling and two ‘biners in the middle point you can make the rope run in a more straight line). Also when rappeling down slings come in handy, and they of course also can be used in rock climbing. A piece of gear that definitely needs to come along. When you’re leading a climb you’ll need quick draws (Read Tomás superb article on Ultralight Quick Draws). As so often, lighter quick draws means you either can take more or then safe a substantial amount of weight for the same performance. Some clip in easier and are better handled with gloves, so keep that in mind when building your rack. I thought I’d be set with my two DMM Phantom locking ‘biners, though I was wrong. And so I bought a few more locking carabiners, in slightly bigger sizes, because they’re easier to operate with gloves on. If you’re not toproping then a about five locking carabiners are good to have along: Three to set up a belay, one to clip yourself in with a sling, and one if you’re belaying someone else. A spare or two in these situations can’t hurt, either. 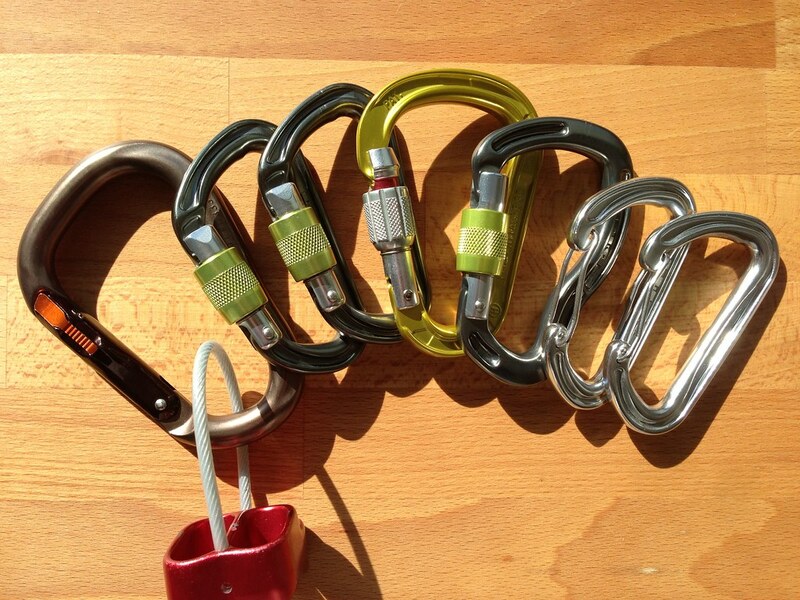 As for non-locking carabiners, I have been using the DMM Phantom gate ‘biner and still think they’re superb. The gate opens easy, they’re light yet strong - a great biner to have along to rack gear. I used the CAMP Speed helmet during all climbing, and really like the comfort of this helmet - light and protective, easy to adjust the size when I wear a beanie or not, not to hot nor too cold. I can wear shades or my googles underneath them, a Headlamp like the Petzl Nao fits easily on it, and it also fits under all my jacket’s hoods. However, with the new Black Diamond Vapor and Petzl Siricco helmets available, the Speed is no longer the lightest option, something too keep in mind when you’re buying a helmet (I used the Petzl Siricco and really like it, especially the magnetic closure that’s easy to operate with one hand is very good). Because my helmet doesn’t have a visor to keep ice and water from flying in my face, I was wearing the comfortable POC Iris 3P Googles. They have a superb view and while they on occasion were fogging up, the fog cleared up quickly. I can wear them with my Speed Helmet without problems, but had problems to get a comfortable fit with the new Petzl Helmet. 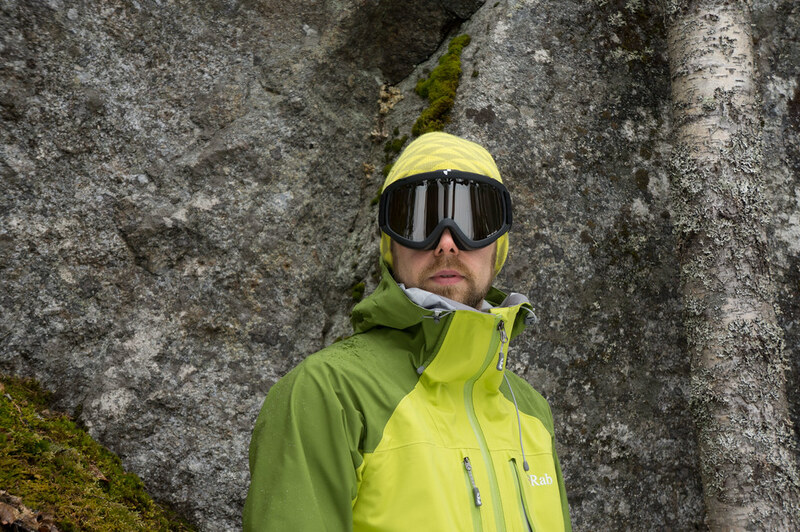 The googles’ lens are antiscratch and have a oleophobic & hydrophobic treatment which means it keeps fat and water off your lens very easily - a very welcome function when climbing ice where you sweat and ice is coming at you. A great pair of googles that I can recommend if you climb ice or ski. I usually use a Petzl Verso, though enlightenment struck as I tried the Reverso 4. It’s only a tad heavier than the Verso but offers so much more functions: You can secure two climbers that are climbing after you, and connect it to your belay with the ring. 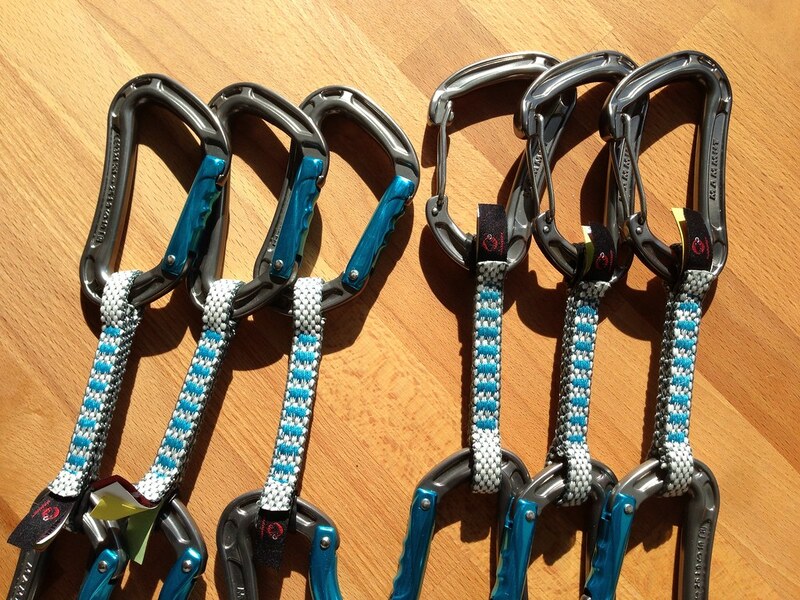 As with the Verso, you can belay and rappel. When not toproping then definitely a piece of gear to take along. There’s plenty of belaying devices around, though one to consider is the Mammut Smart Alpine which offers similar functionality as the Reverso though has the added benefit of breaking the rope dynamically in the case of a fall. A superb rope for toproping, also on ice. It’s my rock-climbing rope which I diverted from its intended use to toproping on ice. Super smooth handling, light, great knot-ability, and with a middle marking, this is a great piece of kit which does the job very well. For lead climbing on ice a twin or half rope is needed, though, and also there the market offers plenty of great ropes for us ice climbers. 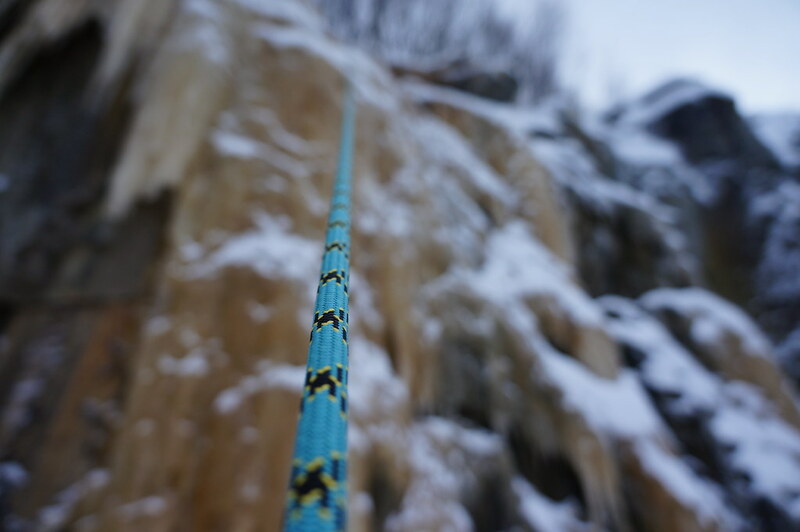 I used a BEAL rope which were very great to handle and didn’t soak out, and if you’re serious about ice climbing then you won’t get around getting a twin or half rope (Here’s an explanation on the difference!). The Arc’teryx R320 has been my harness of choice and I like the racking capacity it has - plenty of gear fits on the four gear loops. For ice climbing a Petzl Caritool or Black Diamond Ice Clipper would have been useful, though I made work without this season. It’s comfortable, the leg loops are big enough to step through in case you put on your crampons before your harness (happens!) and with it’s good design it feels well over pants and jacket. If one is serious about ice climbing, the Arc’teryx I340A of course would be a nice harness to have, though for the time being the R320 is very good for my needs and can be used all year around. A backpack is the best way to get your gear from home to the ice fall. But what when between the ice fall and home there’s a airplane? 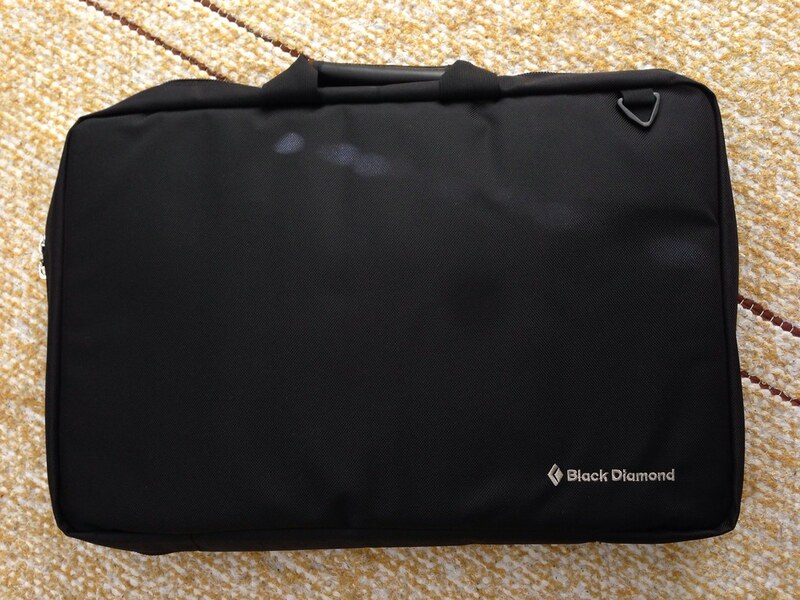 Backpacks with the sharp tools outside aren’t great for travelling - enter the Black Diamond Ice Box. 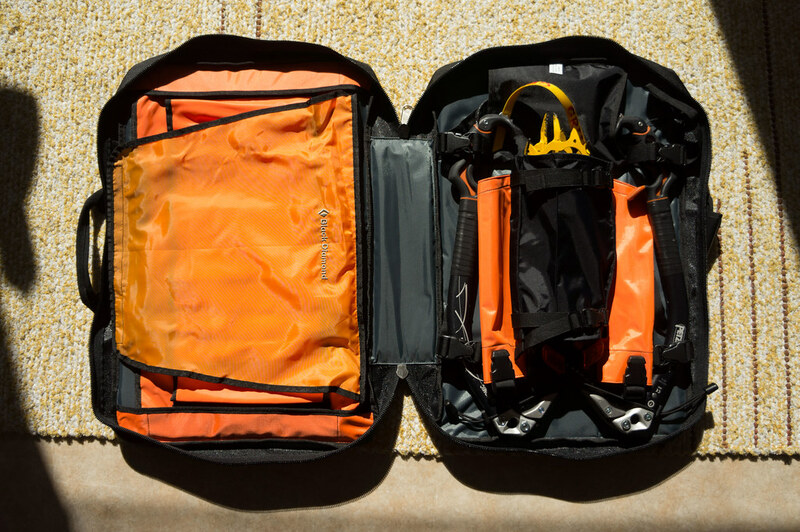 It fits four tools, one pair of crampons, up to ten ice screws, a mesh compartment for drying gear and still has plenty of space left for small stuff. For me very important too, is that its perfect to store the ice climbing gear safely and using minimal space at home, out of the reach of an exploring toddler. A great piece of kit for ice climbers that travel a lot and want to store their gear safely when not in use. 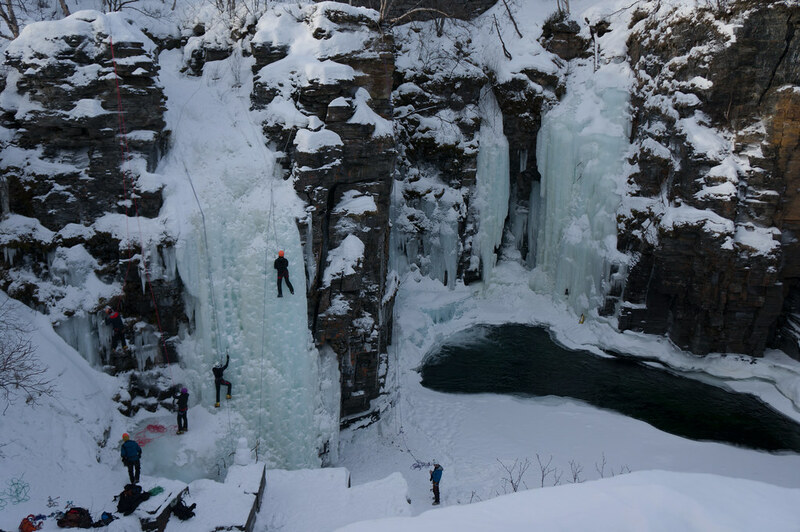 Most of the ice-climbing related gear has been used for a week of ice climbing this season. These short reviews thus should be considered as an initial review, which will be updated during the next winter season when I have used the gear more. If you have questions, please use the comments to ask!